Hey Yogurt-Maker, Where'd You Get Those Microbes? Historic yogurt-making cultures held by Mirjana Curic-Bawden. Siggi Hilmarsson, founder of siggi's Icelandic-style yogurt, calls Mirjana Curic-Bawden at Christian Hansen "the doyenne of cultures." Yogurt is a truly living food. The bacteria that transform milk into this thick and sour food also provide a sense of mystique. For Atanas Valev, they carry the taste and smell of his homeland, Bulgaria. "It's just the smell of the fermented milk. It's tart, tangy tart. That's what yogurt should taste like," he says. The secret to that taste, he says, is the bacteria that Bulgarian yogurt-makers have used for thousands of years. So when he flew to the U.S. in 1991, he brought with him, in his luggage, two jars of those precious bacterial cultures. "It was homemade yogurt in Bulgaria," he says. "Sheep milk yogurt. I got it from a shepherd." He kept that yogurt and used it as a "mother culture" to make more, for himself and his friends. The process is simple. Add yogurt to warm milk, and the bacteria in it multiply, consuming lactose and turning it into lactic acid. Gradually, the milk becomes more acidic and eventually sets in a gel. Valev is now trying to bring the taste of his boyhood to America with his company, called Trimona Bulgarian yogurt. Siggi Hilmarsson, founder of a company that makes, of course, siggi's Icelandic-style yogurt, has also tried to duplicate the taste of his childhood. "To begin with, I just bought yogurt off the shelf and tried to incubate the cultures from those," he says. Many small yogurt companies tell stories of starting with bacterial cultures handed down from previous generations. "My uncle, a long time ago, got his own" yogurt-making cultures, says Hannibal Murray, operations manager of White Mountain Foods in Austin, Texas. In fact, though, it's not feasible to carry out commercial production the old-fashioned way, using existing yogurt to inoculate each new batch. This process, called backslopping, is inefficient and can raise the risk of contamination. If you're in the commercial yogurt business, you need a microbe manufacturer, and that means a company like the Danish firm Christian Hansen. Its North American headquarters is in Milwaukee. 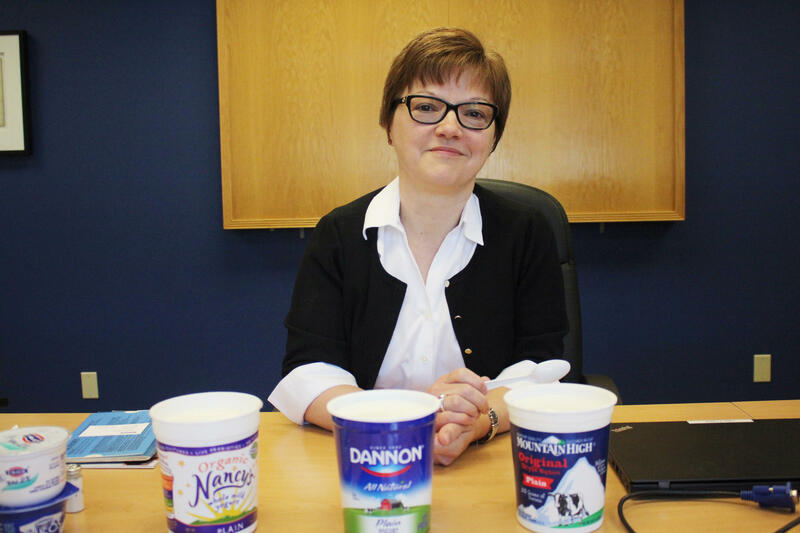 Mirjana Curic-Bawden is the house expert on yogurt-making microbes at Christian Hansen. She, too, has childhood memories of homemade yogurt. "I grew up in Belgrade, in Serbia, and my grandmother lived by the Bulgarian border and she made yogurt by herself," she says. "My grandmother would be really proud of me. She never understood why I needed to go to school to make yogurt." What Grandma didn't realize is how science can change the taste and texture of this food. Despite the wild proliferation of yogurt labels these days — say hello, please, to Icelandic yogurt, Bulgarian yogurt and Australian yogurt — they all are made using a very similar recipe. So what makes Yogurt A different from Yogurt B? Curic-Bawden explains that there's lots of variation within these two bacterial species, just as there's immense variation within our species, Homo sapiens. Some of these little creatures gobble up lactose faster than others; some release more of that sour, tangy flavor. So her company, Christian Hansen, has assembled a kind of microscopic zoo: 60 different strains of yogurt-making bacteria. They were originally collected in the ancestral homelands of yogurt, including Greece, Turkey, Bulgaria, the Balkans and the Caucasus region. "We blend them in different ratios to achieve a certain texture and flavor," Curic-Bawden says. Yogurt-makers with a particular vision for their yogurt make pilgrimages to Curic-Bawden's workplace, looking for the bacterial blend that's just right for them. "She's the doyenne of cultures," says Hilmarsson. A typical yogurt-making culture contains four to six strains of bacteria. Each company's exact mix of microbes, however, is a closely guarded secret. Deciding on that mix can be complicated. Douglas Stewart, co-founder of Smari Organics, which makes Icelandic-style yogurt, says his company had to adopt a different bacterial culture when the first version produced yogurt that the company's yogurt-straining equipment couldn't handle. "If we found something that worked better, we'd switch," Stewart wrote in an email. Many yogurt-makers add additional species of bacteria to the mix, such as Lactobacillus acidophilus, Bifidus regularis and Lactobacillus casei. These "probiotics" may improve intestinal health (although the evidence for this is mixed), but they don't affect the yogurt's flavor very much, says Murray. It's possible to get your hands on yogurt-making cultures that, do, in fact, trace their lineage back to someone's kitchen. There's a community of culture-sharing yogurt enthusiasts, and a company called Cultures for Health sells various yogurt starters, some of them labeled as Greek, Bulgarian and Finnish. But Julie Feickert, the company's founder, says she acquired these bacterial cultures from "people I know": fellow yogurt-makers near Portland, Ore., where she started the company, and elsewhere in the U.S. The labels on these starter cultures, she says, refer to their historical origins, but their actual source is a matter of "legends and stories." Curic-Bawden, for her part, believes that true "heirloom" yogurt cultures are now almost impossible to find. She says that most home yogurt cultures these days actually trace their ancestry to yogurt that someone bought in a store, which in turn came from the bacterial collections of companies like Christian Hansen. Christian Hansen grows those microbes on a grand scale. Bacteria from this one company ferment 40 percent of all the yogurt sold in America. Max McGloughlan, one of the chemists in charge of production at the company, shows me 8,000-gallon tanks where the bacteria multiply, and machines that concentrate the microbes into a thick soup. "After it is concentrated, we bring it over to our freezing area for pelletizing, and we make small droplets of frozen bacteria," he explains. There are 100 million individual microbes in each little pellet. Each pound of pellets will make 1,000 gallons of yogurt. They leave the factory in big insulated boxes: a few hundred pounds of microbe pellets packed together with a few hundred pounds of dry ice, on their way to yogurt companies across the country. They are the living heart of the yogurt business. Now back to the food we have been learning about all week, yogurt. When you eat it, you can say I am eating something that is still alive. Yogurt is full of special bacteria. They ferment milk into something thick and slightly sour. There are old-fashioned ways to use these yogurt-making microbes, but, as NPR's Dan Charles reports, commercial yogurt-makers today are using modern science. DAN CHARLES, BYLINE: For Atanas Valev, the taste and smell of yogurt is the taste of his homeland, Bulgaria. ATANAS VALEV: It's just this smell of the fermented milk. And it's tart, tangy tart. That's what yogurt should taste like. CHARLES: He's now trying to bring that taste to America. His company is called Trimona Foods. The secret to that taste, he says, is the bacteria that Bulgarian yogurt-makers selected, preserved and used for thousands of years. And when he flew to the U.S. in 1991, he brought with him in his luggage two jars of these precious bacterial cultures. VALEV: It was a homemade yogurt in Bulgaria. It was sheep yogurt. CHARLES: But you got it from a store? You got it from a shepherd? VALEV: No, I got it from a shepherd. CHARLES: He kept that yogurt and used it as a mother culture to make more for himself and his friends. It's a pretty simple process. You just add a bit of yogurt to warm milk. The bacteria multiply, consuming lactose and turning it into lactic acid. That makes the milk more acid, and eventually it sets in a gel, yogurt. But when he started making yogurt on a factory scale, he couldn't do it the old-fashioned way anymore. It would have taken a huge amount of yogurt to start each new batch. Plus, this method, called back slopping, can raise the risks of contamination. 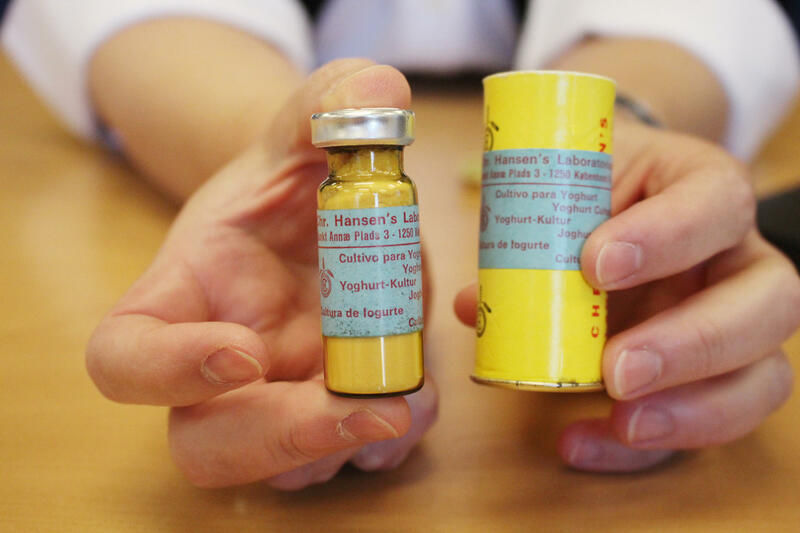 If you're in the commercial yogurt business, you need a microbe manufacturer, like the Danish company Christian Hansen. Its North American headquarters is in Milwaukee. CHARLES: Good. Good to meet you. Mirjana Curic-Bawden is an expert on yogurt-making microbes. She's a long way from home, too. CURIC-BAWDEN: I grew up in Belgrade in Serbia, and my grandmother lived nearby the Bulgarian border, and she made yogurt by herself. CHARLES: She moved to Denmark to study microbiology then went to work for the company Christian Hansen. CURIC-BAWDEN: My grandmother would be really proud of me. She never understood why I had to go to school to make yogurt. CHARLES: What grandma didn't know is that science can change the taste and texture of this food. All yogurt is made from milk plus two specific kinds of bacteria. CURIC-BAWDEN: Streptococcus thermophilus and Lactobacillus bulgaricus. CHARLES: But the curious thing is two brands of yogurt can be made from the same milk, the same two species of bacteria, and still taste quite different from each other. That's because of the bacteria, Curic-Bawden explains. Yes, they're all Streptococcus thermophilus and Lactobacillus bulgaricus, but they can still differ just as people do. CURIC-BAWDEN: I mean, we are short, tall, you know, chubby or skinny. CHARLES: And these bacteria, some of them, gobble up lactose faster than others. Some release more of that sour, tangy flavor. So her company has assembled a kind of microscopic zoo, more than 60 different strains of yogurt-making bacteria. CURIC-BAWDEN: And we blend them in different ratio to achieve the certain texture and flavor. CHARLES: Yogurt-makers with a particular vision for how their yogurt should taste - they can go to Curic-Bawden's company and find the bacterial blend that's just right for them. CHARLES: And Christian Hansen then grows these microbes on a grand scale. Bacteria from this one company ferment 40 percent of all the yogurt sold in America. Max McGloughlan, one of the chemists in charge of production here, shows me 8,000-gallon tanks where the bacteria multiply, machines that concentrate them into a thick soup. MAX MCGLOUGHLAN: After the bacteria is concentrated, we bring it over to our freezing area for pelletizing, and we make small droplets of frozen bacteria. CHARLES: There are 100 million individual microbes in each little pellet. Each pound of pellets will make 1,000 gallons of yogurt. They leave here in big insulated boxes, a few hundred pounds of microbe pellets packed in with a few hundred pounds of dry ice. They're on their way to yogurt companies across the country. They are the living heart of the yogurt business. Dan Charles, NPR News. Transcript provided by NPR, Copyright NPR.